The Windows Registry is a hierarchical database that contains information, settings, and options about all of the software and hardware installed on the Windows Operating System. It contains information about various users that are created for the system, and the programs and Windows preferences of those users. It also keeps the settings about how Windows behaves. The main aim of Registry Cleaners is to remove the invalid registry keys, shortcuts, and other types of errors. Registry Cleaners are not very helpful in improving the performance of the system. You’ll see performance impact only if there were thousands of invalid registry keys and errors on your system. Removing invalid Registry entries is a great practice. The registry entries left by previously uninstalled software could interfere with the new software that you are trying to install. For example, we know that only one antivirus should be used at a time; you had an antivirus installed on your system before but now you are trying to uninstall it and install another one in its place. If the previous antivirus is not removed completely and properly from the system then the new antivirus software may read the registry keys of the previous antivirus and may assume that that software is already installed on the system, and therefore may not install as long as that entry is present in your Registry. So, always run your Registry cleaner after uninstalling programs. CCleaner is the most popular, the most trusted, and the most recommended Windows Disk and Registry Cleaner and Optimizer. 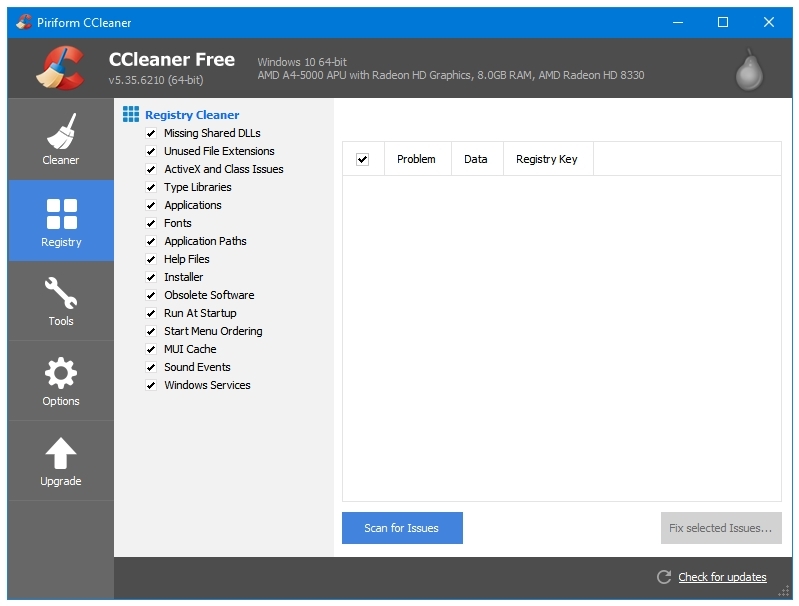 CCleaner started with two cleaning components, (Disk) Cleaner and Registry Cleaner. The Windows Registry is a delicate thing. It can break your system. Therefore, it is recommended to either not use any registry releated tools such as cleaners, defragglers, or optimizers, but if you got to use one then there is no better choice than CCleaner. The Registry Cleaner is the second item on the CCleaner program sidebar. Clicking the Scan for Issues button starts scanning Windows for the Registry related issues. Once it has finished scanning, the Fix selected issues button becomes clickable for you to fix the Registry related issues. Run it a couple of times to catch those hard to find Registry errors that CCleaner might have missed in the first scan. Auslogics Registry Cleaner is created by Auslogics, who make a great freeware called Auslogics Disk Defrag. Auslogics has extremely good ratings on all kinds of software portals. The disk cleaner is their premium component, and is not available as a freeware. But you can get their highly rated Registry Cleaner for free. 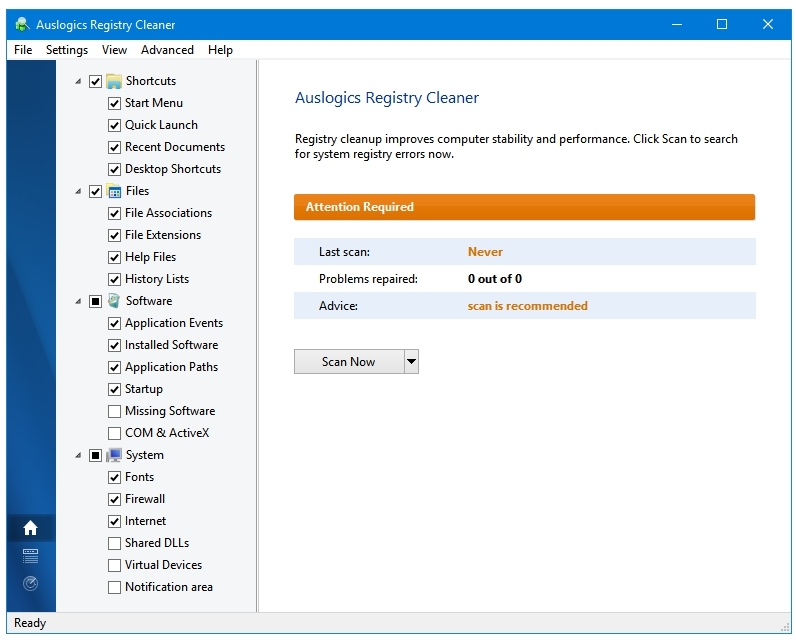 Auslogics Registry Cleaner is a reliable software that scans and cleans the Windows Registry related errors. It displays Registry related errors into four categories – Shortcuts, Files, Software, and System. There are many options present within each of these categories. If you want to delete only some specific registry keys then it lets you do that as well. You need to click on the Find Registry Keys button, and then search for the keys that you want to delete. There is a Filter button at the left top of the search window that can be used to filter the search results. Auslogics Registry Cleaner tries to install some of its products during install, and it asks to change your homepage to Yahoo. Make sure you uncheck these things during install if you do not want them. Wise Registry Cleaner comes from WiseCleaner, the creator of Wise Care 365. You can get their Registry Cleaner component in two ways – either in their full cleaning and optimization suite called Wise Care 365, or as a standalone application called Wise Registry Cleaner. Wise Registry Cleaner is available as Portable as well as an Installer. It has three scan modes – Fast Scan, Deep Scan, and Custom Area. The Fast Scan scans only those Registry entries that are considered safe by the software, the Deep Scan is Wise’s full scan mode that scans all of the Windows Registry for errors, and the Custom Area mode lets you select the categories of Windows Registry that you want to scan. Wise Registry Cleaner has two other system optimization features called Registry Defrag, and System Tuneup. The Registry Defrag is a defragmentation tool for Windows Registry. The System Tuneup tool has various system optimization options in the following four categories – Bootup/Shutdown acceleration, System Stability, System Speedup, and Network Speedup. Wise Registry Cleaner also has scheduler option that lets you clean your Windows Registry automatically. You can select Run Type, Day, and Time to perform Registry cleaning and optimization on your computer. 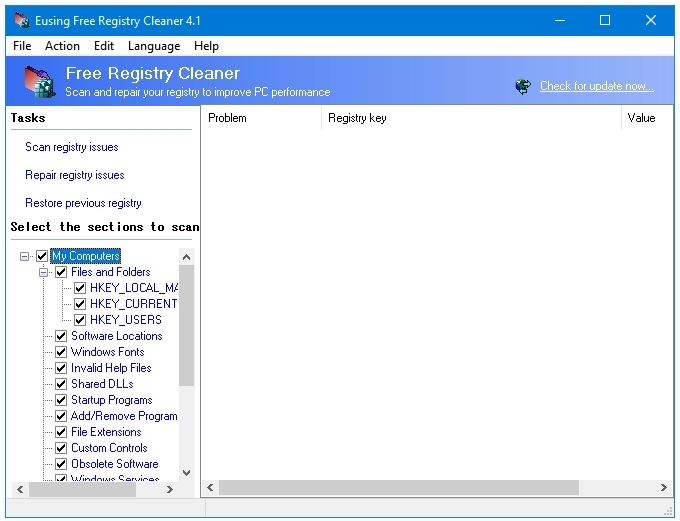 RegSeeker in not just a Registry Cleaner, but a complete Windows Registry utility with many cleaning and optimization features built into it. 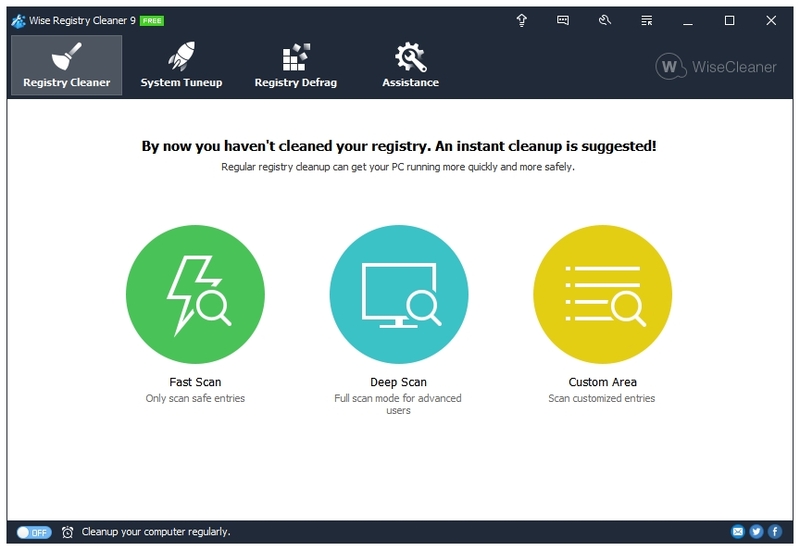 RegSeeker has divided all of their tools into four categories – Applications and startup, Registry, Tools and system, and Computer cleaning. We are concerned only with their Registry Cleaner component here. You can access that by clicking on the Registry button in the main program window. In the next window, click on the Clean the Registry option to open their Registry Cleaner. Along with the registry cleaner, you get two other important registry related features a well – Find in registry, and Backups. The Backup before deletion entry is checked by default. 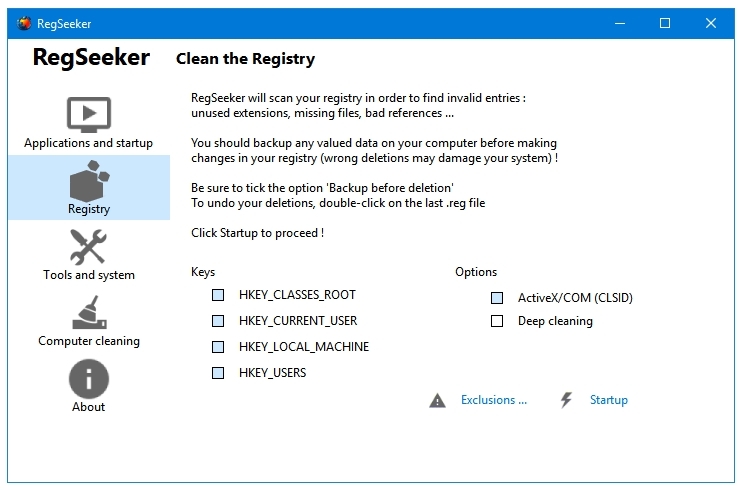 The Find in registry feature lets you search Windows Registry for specific registry keys, and the Backups feature lets you access backups of the Registry created by RegSeeker before the cleaning operations. Eusing Free Registry Cleaner is a straightforward registry cleaner program with no promos, ads, or buttons for extra tools; it does occasionally ask the user to donate. The interface, although old, is very functional. There are three buttons on the left sidebar of the program for three of the four main tasks of the program. These buttons are – Scan registry issues, Repair registry issues, and Restore previous registry. The option to Backup Full Registry can be accessed by clicking the File option on the program’s menu bar. It would have been nice to see a button for this task as well along with the other three buttons. You can open any registry entry present in the scanned results list in the Windows Registry Editor either by clicking the Edit button in the Menu bar and then going to Open in RegEdit; or by right-clicking on it, and then selecting Open in RegEdit. This program allows you to exclude the registry items as well if you want to be a little careful.